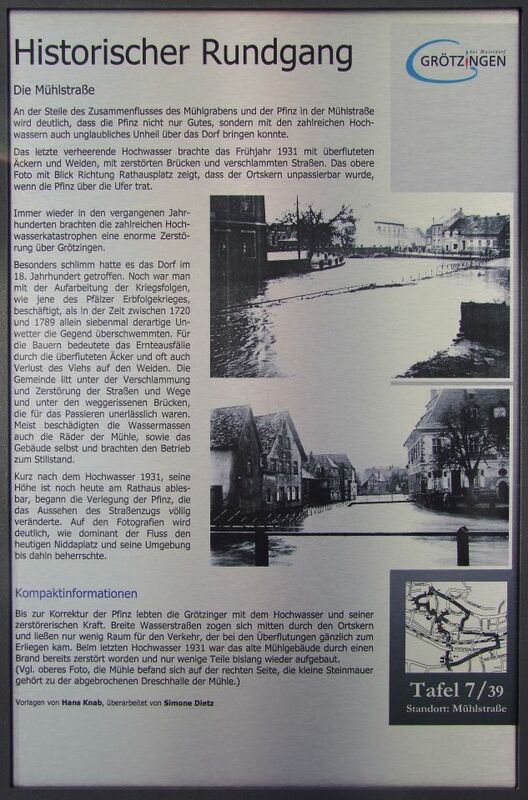 Again and again in recent centuries brought the numerous flood disasters enormous destruction on Grötzingen. Particularly bad it had hit the village in the 18th century. Yet it was with the processing of the consequences of war, such as those of the Palatinate War of Succession, busy, than in the period 1720-1789 alone seven such storms flooded the area. For farmers, this meant crop failures through the flooded fields and often loss of cattle in the pastures. The community suffered from siltation and destruction of roads and trails and snatched away the bridges, which were essential to the passage. Usually the water masses damaged the wheels of the mill, as well as the building itself, and brought the operation to a standstill. Shortly after the flood in 1931, his height is still readable at the Town Hall, the relocation of the Pfinz, which completely changed the look of the Straßenzugs began. In the photographs, it is clear how dominant the flow dominated today Nidda square and its surroundings until then. At the point of confluence of the mill race and the Pfinz in the Mill Road is clear that the Pfinz not only good, but with the numerous floods could also bring incredible disaster to the village. The last devastating flood brought the spring of 1931 with flooded fields and pastures, with destroyed bridges and muddy roads. The top photo looking towards town square shows that the village was impassable when the Pfinz burst its banks.